Ah-ha! Even though I told Kiersten she didn't have to worry about the interview questions I had sent her, she insisted on replying. Yes, people, insisted. She's just so cute like that. So enjoy the interview with her, and then find out how you can win a SIGNED copy of Paranormalcy! If you were a paranormal creature, which would you be and why? A hag. If you could see me right now, you'd understand. Seriously though, even though my faeries are amoral-bordering-on-evil, I wouldn't mind the ability to go anywhere in the entire world by opening a door and using the Faerie Paths. I'd promise to be very very good and not kidnap any mortals. Except you, because you seem like you'd be fun to go to Guam with. If you could get any gift for your birthday (and I mean ANY gift) what would it be? How sad is it that nothing comes to mind? This is what drives my husband crazy about me. "What do you want for your birthday?" "I don't know. Nothing. I'm fine." Have you ever wanted to do something crazy-adventurous? Yes! However, I have an overdeveloped sense of self-preservation that prevents me from ever acting on these desires. I have always thought that sky-diving looked amazing, though. I'd never do it, but I envy those who can and do. Evie’s favorite color is pink, what’s your favorite color? If you could dye your hair that color for a week, would you do it? Mmm, no. I don't think green works as a hair color very well unless your hair is naturally black and the green is just accents. I have always secretly wanted brilliant electric blue hair though. Maybe someday I'll get a wig. For a while I had a purple streak in my hair and it made my happy every time I saw it. Plastic, although if I were a good person I'd say reusable bags from home, of course. Sadly I never remember to bring them. Bad, bad Kiersten. I promise I recycle. Both! As long as it's not goat cheese or feta. You have to write a story about super-powered penguins. What is your main character's name and superpower? Aww, did you ever read Mr. Popper's Penguins? It was my favorite book when I was little, although I can't remember hardly anything about it now. Except that apparently Jim Carrey is slated to star in a movie adaptation. I cannot tell you how sad that makes me on many, many levels. Wait, that wasn't an answer, was it? So I suppose my main character's name is Mr. Popper and his superpower is preserving Kiersten's fond childhood memories by making sure Jim Carrey doesn't get to act in that film. 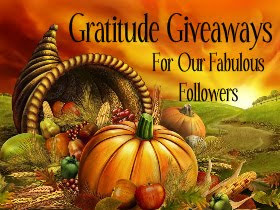 This giveaway is part of Gratitude Giveaways! *SQUEE* this interview made me so happy! :) Kiersten seems really cool and funny. I'm DYING to read Paranormalcy! Meet the Penguin Mr Poppers! I have never heard of that book, but it sounds so fun!! I enjoyed the intervew so much and kiersten is such a fun person!! Although I bet I would have liked it if I'd read it as a kid- I did not enjoy Mr. Popper's Penguins. I thought it was really kind of annoying. But, I know it's much beloved by children everywhere, and I don't really think I like the idea of Jim Carrey staring in it, for much the same reasons I hated that Mike Meyers did The Cat in the Hat... Not exactly kid friendly. Sigh. This was a great interview though! I haven't thought about Mr. Popper's Penguins in a long time! I'm definitely with you on the Kiersten White love...she's great! And I've had both green AND blue hair, which I won't comment on any further! I bleeping loved Mr Popper's Penguins too, but my kids hardly like it. What's up with that?!?!? Mini Coopers are pretty cute! I think a Smart car would be fun. Great interview and thanks for the chance to win a copy of the book! Sounds excellent. I always love Kiersten's interviews. They are just so fun to read. They only make me want to read Paranormalcy even more than I already do! Oh wow Jim Carrey?!?!?!?! NOOO!!! The horror! What an awesome interview. I LOVE Kiersten! Her blog is hilarious and I loved Paranormalcy as well! Great interview! I loved Paranormalcy!! Great interview! I like Kiersten's writing and from this interview she sounds like a fabulous person!! Great interview! I'm totally with Kiersten on the sky-diving thing. It looks like fun, but I'd never be able to do it. Great interview! I have already read and own a signed copy of this book so I will opt out of entering your contest and let others have a chance...:) It was a great book and I highly recommend it! I am SO hyped to read this book!!! I used to love Mr Popper's Penguins. I can't believe they are going to let Jim Carrey star in it. Great interview! I loved your first question and Kiersten's answer! I answered the same thing in the question you asked on the form. Fairies don't really have a bad gig. I also really liked the question about green hair. Thanks so much for the great giveaway! I really appreciate it! The purple strip in your hair sounds like a cool idea I might try. I love purple. But I agree don't die your whole head a funky color just some highlights. Thanks for the fab interview! awesome interview ive heard soooo many aweosme things baout this book and Kiersten greta post ! I loved this book too!! Hag....too funny. I really enjoyed the interview, she seems like a fun person. I can't wait to read Paranormalcy. Kiersten I love Paranormalcy. I won it through Goodreads and left a very posative review. I reccomended it to my children. I have teen girls who love to read para books. Thanks for sharing with us today. Funny! I only like Carrey so-so. Sometimes he is just over the top annoying. But we liked him in The Mask. I'm with you on the Birthday answer.. I don't know; don't need anything. Loved the interview! Kiersten is awesome! Thanks for the awesome giveaway! Hilarious interview! I love Kiersten's answers, she sounds like an awesome person. I love dyed hair, Ramona in Scott Pilgrim vs. the World had the most amazing hair. My favorite was her purple hair. hey! 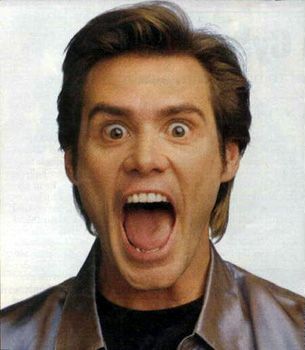 jim Carrey is zany! LOL! I remember my girls all having their own weirdness with their hair - the first had magenta streaks, the second had purple streaks, and the third had one chunk of white right near the front of her hair (at the side, though, not the front - that would have made her look like a skunk). Great interview. Really enjoyed it. Thanks for taking the time! Very cute interview! Loved your questions. And I'm with Kiersten on her opinion about Jim Carrey. I liked him in "The Truman Show" but everything else...ummmm....not so much! I just finished this book today from the library and really enjoyed it. She left it open enough for a sequel, which I will totally pick up when it comes out. The beggining had me totally laughing and I love that there aren't actual swear words, just "bleep." Cracks me up and makes it clean. I'd love to own a copy! Great interview! I loved her book and she sounds really cool! Awesome interview! I can't wait to read Paranormalcy. I've never read Mr. Popper's Penguins so I can't say whether or not Jim Carrey is suited for the role. What an awesome interview! I can't wait to read this. Great interview! I agree on the cheese. I love both types. Thanks so much for sharing the great interview, loved Kiersten's responses! Paranormalcy looks like such a good read. Oh,I am NOT a fan of Jim Carrey, either! Just yuch! And I LOVE, LOVE the Mini Coopers! My hubby teases me to no end over the fact that I am a take everything with me kind of girl, run bunches of errands all in one day, yet I love the small cars! You sound like me/my type of person! Great interview!